Cherry Mischievous: I WON WOLF SIGNS!! I would like to thank Vivian Arend for hosting such a delicious*blush*, delectable and droolworthy contests, the Holiday Hotties Tour and the Sinter Claus contest!! And another shout out thank you because I won a copy of Wolf Signs by Vivian Arend and Deja Vu by Vivian Arend and Jambrea Jo Jones from Viv!! Woohoo!! 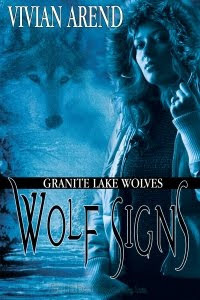 Source: Info in the About Wolf Signs was taken from the author's website at http://vivianarend.com/books/wolf-signs on 13/12/09. Hey Cherry! This is one of your fellow book bloggers using another name. Take a look at my other blog if you have a chance and let me know what you think! You go girl! You go girl! You go girl!!!!!! Congrats and happy hussy reading!! Ooooo I love wolves! Enjoy! Thank you everybody! I would be posting a review soon as a "thank you" to beautiful Viv! Congrats on winning. They both look like mighty good reads:) Can't wait to read the reviews! Congratulations - this is one I want to read; looking forward to your review!